“If I want to start a business I need money to pay for my new snazzy website, my logo and my marketing. Sheez this going to be expensive, I’d better get a loan”. STOP! HALT! ARRETEZ! There are so many free tools and resources out there that can help you start your online business with for free. I’ve listed 44 free tools here to get you started, there are many many more. Whatever you need, google ‘product/service’ + ‘free’ and see what comes up. Some of the resources below have free plans which you can then upgrade for more functionality as your business grows. Or, you can stick with the free plan if it suits your needs. Wix is an awesome free website builder. It even has an ADI (artificial design intelligence) feature which will come up with a bespoke layout depending on what you need the site for. It’s really easy to use with drag and drop features so you can move things around to where you want them. I built a simple one-page website for a friend in an hour (and I can barely work my iPhone!). Wix has loads of templates to choose from, whether you want a foodie site, a bookstore, or a clothing site, they have a design for everything. Weebly is a very similar site to Wix, where you can build yourself a free website or online store. It is also a drag and drop for easily customisable templates. Just be aware that your domain name will end with ‘weebly.com’. If you don’t mind that then you could use Weebly instead of Wix. Just a note: I have built a website on Wix before but IWMLBproject was built using WordPress.org with Siteground as the host. These are not free so only go for paid sites and hosting if you really need it. I absolutely LOVE the Pop Up Business School. It is a totally free resource for anyone wanting to start a business. They host free pop up events around the UK (and occasionally the US) but if you don’t live in the vicinity, you can always use their free online ‘step-by-step’ guide. A great way to start your online business for free is to sell before you create. You can build a landing page with any of the below links and either take payment or sign-ups before you launch the product. You do not need to be a creative genius to make logos or images for your site. I am about as artistic as a dead fly and I still manage to do all the graphics for IWMLBproject. They may not be the greatest in the world but I can’t afford to pay someone to make them look prettier! Canva is an absolutely incredible tool, I really can’t believe it is free, to be honest. You can create images for Pinterest, Facebook, Instagram, banners, checklists or whatever you need for your website. They have ready-made templates or you can create your own custom dimensions. You can upload your own images or use their free ones. The only annoying thing with the free plan is that you can’t resize images one you have started your design. You can do this with the paid plan but unless you are making money with your business, it is probably not worth upgrading. Above is an example of a Pinterest pin I made recently using Canva. Pablo for Buffer is another image creation tool that I have just discovered today! It doesn’t have as many customisable options as Canva but the cool thing about is that you can resize your image for Facebook, Twitter, Instagram and Pinterest. Having had a quick play around with it, I am going to stick with Canva for Pinterest and try Pablo for Instagram. Large images can really slow down your site so you are going to want to reduce the file size before you upload them. Optimizilla is amazingly easy to use. You just upload your images from your computer, Optimizilla reduces the file size and then you can download them back to your computer again. As I mentioned above, I was not the star of my art class so I have a hard time knowing which colours look good together. Color hex is great as you can find a colour you like, paste the #hex colour code in the box at the top and it will give you suggestions for complementary colours. Be very careful when using images on your site. You cannot just google an image and then copy and paste it into your site as someone else owns that image. If that someone else finds you using their image, you could receive a rather large bill! The solution to this is to use free stock photography. These are photos that are free to use and you don’t need to credit the photographer. I use these three sites to find free images for IWMLBproject. Obviously, the internet has a wealth of information for free. Here are a couple of useful resources with mentioning. The library! No, I don’t mean some trendy online resource, I mean the ACTUAL library, with books and shizz. Buzzsumo has a free feature where you can search websites or keywords for ‘most shared’ content. Really useful if you have a favourite brand or you want to find out what is trending in your niche. You only get a few free searches a day but that’s enough for some initial research. I love podcasts as you can continue learning and researching when you are doing other things. Podcasts are great for commutes or when you are getting ready to go out or whenever really. If you have an iPhone you can get the podcast app and then search for the podcasts within your niche. ‘How I built this with Guy Raz’ is absolutely worth a listen. He interviews the founders of huge business about how they built their companies. It’s really interesting how they started! You do actually have to put the headphones on! If you have a website, you can link it up to google analytics to get an insight into your traffic. I personally don’t use it as WordPress has a Jetpack plugin which shows traffic stats on the WordPress dashboard. It could be very useful for you though if you want to track your visitors. Slack social is a social media scheduler which supports Facebook, Twitter, LinkedIn, Blogger and Tumblr. Very similar to Buffer (below), it allows you to schedule your posts and then it sends them out at the desired time. Buffer is also a social media scheduler however it also supports Instagram and Pinterest. I have just signed up to use Buffer. I like that there is a browser extension, so if I am reading an article and think people may find it interesting, I can add it straight to my queue for Twitter, Facebook, Insta etc. With the free plan you get 10 queued items per social media platform, if you want more scheduled posts then you need to upgrade. 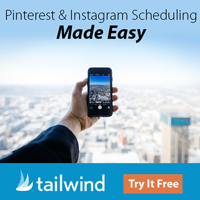 Tailwind does have a free plan with which you can schedule up to 100 pins on Pinterest, and 30 posts on Instagram for free before deciding if you want to upgrade. Although Buffer allows scheduling to Pinterest, I use a paid plan with Tailwind as I am sending out around 30 pins a day. The great thing about Tailwind is that it produces a ‘smart schedule’ which suggests the times your readers are most active. If you aren’t a blogger, you may want to stick with Buffer as that should give you what you need. Mailchimp is a free email marketing product which lets you build a subscriber list and send out automated emails. The free plan allows up to 2,000 subscribers and 12,000 emails per month which should be more than enough when you are starting out! Side note: I upgraded to a paid plan on Convertkit as it is more ‘blogger friendly’. If you do not have a blog then MailChimp could be completely sufficient for your needs. If you don’t want to set up a website for your online shop just yet, you can sell on other platforms which usually only take a small % of whatever you have sold. So no upfront costs. Etsy is the marketplace for selling your handmade goods. They take 3.5% of your sales so a good place to start if you don’t want to host your own online shop yet. eBay does allow you to set up your own shop, however, there are 3 paid plans for this. You can opt to pay as you sell to keep the costs down at the beginning. You can sign up to be an individual seller on Amazon, they take £0.75 per product so you only pay when you sell something. The other great thing about selling on Amazon is that you can sign up to their FBA programme (fulfillment by Amazon). You send them your goods to store and they will pick and pack them as they are sold. This does incur a higher cost but you would need to weigh this up again the cost of storing it yourself. Bonanza is another place to sell your goods with free listings and lower fees than eBay. As they are not as popular you may not get as many visitors. Could be worth checking out though. Grammarly is a fantastic tool, in fact, I am using it right now. My grammar is appalling (I actually spelled ‘appalling’ wrong until Grammarly correct me! Ha! ), I have no idea when to use a colon or a semi-colon or where commas are meant to go. But, I don’t need to! Because Grammarly does it for me as I type. It’s free to use, you just need to download and install it on your computer for it to work. Hemingway is another writing aide I have just come across. It’s great in that you can write everything you want to and then hit ‘edit’ for highlighted words or sentences that need correcting or amending. That way you aren’t distracted while you write. If you need physical equipment for your business, then the below two sites are great for seeking out free stuff you need. You’d be surprised what people give away! You can use Banana print for free business cards. Choose from over 50 designs (which you can edit) and get 50 free business cards free – you just have to pay for postage! My google calendar is my brain. Everything I need to do goes on there, otherwise, I forget. I know there are various fandangled snazzy calenders out there but google does just fine thank you. Google Docs are a life-changer. You can get word, excel, slides, and forms which update in real time. You don’t need to remember to hit save so no more face-planting the desk when your computer crashes and you lose everything you’ve just done. Trello boards are basically like a sticky note to-do list. You can create lists and cards, set reminders and invite others to your board to collaborate. As they are drag and drop, it’s really easier to re-prioritise or move tasks to different days if you need to move your tasks around. Asana is very like Trello. I personally use Trello but I know a lot of people who like Asana. Have a look at both and see which one suits you better. Freedcamp is another organisation app. You can use drag and drop to-do lists, manage a calendar, set reminders and have team discussions all in one place. Dropbox is for free file storage. If you have documentation you want to keep in one place that is easily accessible, Dropbox is great for this. This is my referrer link, if you refer others to Dropbox they will give you additional storage space. Many people swear by Evernote to keep everything organised and in one place. You can write to-lists, add receipts, upload files and sync between your phone and your computer. This is my referrer link, so you will get a month of Evernote Premium for free! If this then that (IFTT) lets you create a series of ‘rules’. I didn’t understand it at first but it is actually pretty cool. For example, when you create a new note in Evernote Notebook, you can set IFTT to create a new draft post in WordPress. How cool is that?! There are loads of these ‘Applets’ which communicate between your devices and save you time. Slack allows you to message between teams to reduce emails and meetings. If you are setting up a business with someone else or you have other people doing things for you, slack could be great for fast, effective communication. Doodle is an easy way to decide on dates and places to save millions of emails backward and forwards. You email out the doodle to the recipients with date suggestions. Recipients fill in their availability and you receive an alert once they have completed it. Then you can review when everyone is free in one easy step. Pomodoro is a productivity method that helps you complete tasks on time. Great for when you are setting up and have a million things to do! The idea is you work for a short burst (say 25 mins) and then take a 5-minute break. The timer helps you to stick to your time blocks and buzzes when your time is up. If you already have a personal account, you can set up a separate business account for free. This will make it easier when doing your tax return as you will have a dedicated Paypal account. Phew! There you have it, 44 free tools to start your online business with no money. If you can’t find what you need for free, an alternative is to borrow from a friend or barter with another business (swap a thing or a service in exchange for something they need). You should be able to find most of what you need for free, or at least at a low cost while you are starting out. Are you setting up a business? Which of these free tools will you use?